The Republic of the Congo gained its independence from France in 1960, resulting in a socialist, one-party state that endured until the late sixties, when a bloodless coup replaced one socialist party with another: the Congolese Party of Labour. Alain Mabanckou’s latest book, Black Moses, unfolds against this backdrop. 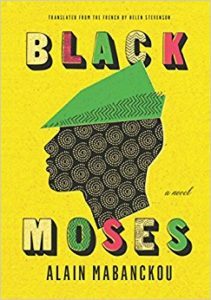 Black Moses, translated by UK-based Helen Stevenson, was longlisted for this year’s Man Booker International Prize. This is Mabanckou’s eleventh novel — his eighth translated into English — and despite the awards and critical acclaim he has received in France and the UK, until this book’s publication there has been relatively little mention of his work in the U.S., particularly considering that Mabanckou is a UCLA professor. We get glimpses of the political changes through Moses, the book’s main character and narrator, who, when we first meet him, is a well-meaning thirteen year old orphan in the countryside just outside of Pointe-Noire, so close to the city that he can see the lights at night. The Congolese Party of Labour’s scientific socialism sweeps through the orphanage, bringing flags and slogans and neckerchiefs for the children. Moses’s father figure — a local priest who visited the orphanage for catechism classes — is no longer welcome. Religion is suddenly suspect, an enemy to the state. Moses takes up with some trouble-making twins, and together they run away to the streets of Pointe-Noire. Moses finds a mother in the madam named Maman Fiat 500. They meet as a result of his kindness — he helps carry her groceries home — and she takes him under wing, first paying him to help around the brothel, and then finding him work at the docks and a place to live. When the mayor campaigns on getting rid of the prostitutes from the Maman Fiat 500’s ethnic minority, she and her girls disappear, their brothel flattened. It reduces Moses to rubble; he has a psychic break. The book is funny and tear-inducing because the first-person, reportage style of the writing shows such a singular view of the world through an adolescent’s — then young man’s — then madman’s — eyes. Elisabeth Philippe of Les Inrockuptibles has compared Black Moses to the work of Charles Dickens, which makes sense considering it’s a coming-of-age-story about an orphan, but there’s more to the comparison. Both Dickens and Mabanckou write with cinematic attention. When Robert Lee Brewer, editor for Writer’s Digest, argued that Dickens’s writing was a precursor to film, he used the opening scene in Great Expectations as example: after leading the reader generally around the churchyard, Brewer explained, passing over the graves of the narrator’s family — his mother, father and five siblings, all buried — and after then taking the reader to the edge of the churchyard, then out to the mountains, then following the river to the sea — after a clear description of the horizon, cut to Pip, the narrator, beginning to cry in the company of his family’s graves. Brewer characterizes Dickens as a master of leading the reader’s eye. In this book, Mabanckou is a master of the closeup: he describes the orphanage Director Dieudonné Ngoulmoumako’s stick-wielding approach to discipline by denoting his hand, whose “tell-tale twitching told you something was missing between those fingers, clawed and keen as an eagle’s talons.” When I say “closeup” what I mean is that sometimes Mabanckou captures the larger view of a character through a montage of their parts; Moses describes one of the wardens as having “looked like an ancient chameleon, with his crooked back and eyes that pointed out left and right, without him moving his head,” and other wardens “who looked as though they’d never been young, with their dark suits, and myopic glasses.” Moses, whose given name is ‘Tokumisa Nzambe po Mose yamoyindo abotami namboka ya Bakoko’ which means ‘Thanks be to God, the black Moses is born on the earth of our ancestors,’ explains that all the orphans “wore wrist bands with our names on — I had to have one on each arm because my name was so long.” Whether the detail is sobering or comical, Mabanckou’s descriptions are whip-smart, isolating a small movement or filtering minor features through the young boy’s laser focus. The use of the closeup, Sergei Eisenstein would say, is full-on Dickensian. Any poor wretch caught red-handed was taken to the main customs office, a tiny little room that smelled of cat’s piss, with rats the size of papayas crossing from one corner to another, knowing they’d never be trapped because they were just part of the scene, and also because many people in the town considered killing an animal equivalent to attacking an ancestor, incurring the wrath of the spirits who are supposed to protect the living and make sure that they’re welcomed into the next world on good terms. Contrast what Helen Stevenson renders as the longer vowels (and spondees) in “poor wretch” and “red-handed” — phrases meant to carry the heavy hand of punishment — with the quick vowel sounds in “tiny little room,” a room which, the reader soon finds, feels infinite if you’re a rat. The first part of this sentence contains lush description. An explanation of the community’s beliefs breaks in like voiceover just when the roving, stout rodents have begun making their rounds, “crossing from one corner to another.” That image of the rats pacing, perhaps mirroring the itinerant posture of a customs officer, carries down through the rest of the sentence, the rats’ movements apparent in the switchback, comma-filled phrasing. By way of the rats’ bravado, this peripatetic sentence conveys the nervous, fluid freak-out wafting from that room. The long sentence is reminiscent of Broken Glass, Mabanckou’s fifth novel and a part of the Pointe-Noire series that includes Black Moses. Broken Glass is written without any full stops. For Mabanckou, that book marks the moment when he was first able to convey Congolese cadences with the French tongue. In an interview with Binyavanga Wainaina at BOMB he explains that he learned French at six years old, which “means that before six I was speaking five or six African languages: Bembé, Lingala, Laari, Munukutuba, Vili, Kamba.” With Broken Glass, he remarks, “if you feel the rhythm of the prose, it’s like the Congolese way of speaking.” The title is no accident. With this book, he broke (in) the French language. His poetic sensibilities are also present in his word choice. Moses refers to the wall of the orphanage, calling it an “enceinte” — a word that means enclosure, but also means to be pregnant. With a single word Mabanckou conjures Moses’s nuanced predicament: he is simultaneously sheltered by and captive to the orphanage; it was both womb and jail, nurturing and artificial. While there’s not an English equivalent that can capture the layered meaning in “enceinte,” translator Helen Stevenson repeats Mabanckou’s complicated tapestry. Rather than translate the French term “youyou” as “ululation,” for example, she lets the word stand and instead provides context, saying, “the girls giving yelps of joy we call youyous.” The world of this book is multi-ethnic and multilingual, so retaining foreign words for the English reader is a strategic fidelity. For the American English reader, phrases like “laughed like a drain” further texture the translation, reminding the reader that, as Mabanckou said about Congolese rhythms in French, every language exceeds its national borders. Translator and scholar Kathryn Batchelor pointed out that Mabanckou includes a dense network of references to other books within his writing, which complicates the translator’s work because she might be hemmed in by a translated title or phrase which doesn’t quite fit Mabanckou’s sentence, because she might not be able to signal a title because it hasn’t yet been translated into English, or because she may miss the reference entirely. Batchelor argues that “any theory that seeks to outline the significance of the hidden titles in Verre cassé must take into account the eclecticism that characterizes Mabanckou’s use of intertextuality as a literary device.” I bring this up as yet another trace of Mabanckou’s poetic background (he’s writing in centos! ), but more importantly, to suggest that Mabanckou’s work should be the subject of further study. Laura Wetherington’s first book of poems, A Map Predetermined and Chance (Fence Books), was selected by C.S. Giscombe for the National Poetry Series. She teaches in Sierra Nevada College’s MFA Program and coedits textsound.org with Hannah Ensor. You can follow her on Twitter and Instagram. https://laurawetherington.com; twitter @L_Wetherington; instagram @l_wetherington.